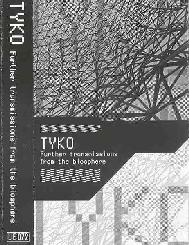 Tyko - "Transmissions From The Biosphere" / "Further Transmissions From The Biosphere" / "A Long Way From One To Zero"
Let's see... how to describe Tyko? Dream-Pop is a good term. Alt/College Space Rock comes to mind (I just made that one up). At the heart of the music is the song. Tyko are impressive songwriters and melody makers, most of the tunes having a catchy pop quality that conjures up alternative rock references. In fact, I think these folks must have been weaned on the music of the 80's. But don't let that scare you away because the music that backs the songs is ethereal, lulling and often deep in space. 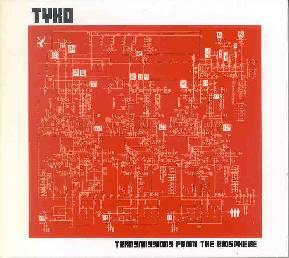 On Transmissions From The Biosphere, Tyko are the trio of Kevin Blagg on guitar, keyboards and vocals, Beverly Blann on bass and vocals, and Matt Kesner on guitar and synths. Songs like "Kids In The Biosphere" blend grinding guitar chords with pounding percussion and carnival-like keys with a penchant for cosmic, atmospheric drift that will sweep you away. It gets even better on "Telstar", with a great mixture of spacey grind guitar, wailing hypnotic notes and melodic rocking chords. Even the most overtly pop oriented songs like "Elastic Brain", are way out in space, with absolutely gorgeous soaring guitar lines and freaky synth embellishment. And if you pay attention to the lyrics you'll find plenty of decidedly not-of-this-Earth subject matter across the various tracks. "Planet One" is a highlight with some of the most beautiful guitars on the album. They're pretty tripped out, yet never lose sight of the song and its linear structured path. "Structuralist Filmmaking Central Image" is the one track where the band stretch out the most. At nearly 9 minutes, Tyko experiment a bit, establishing the melodic guitar patterns we've heard throughout the album, yet taking the time to jam away, venturing into little thematic twists and turns, and rocking out harder than we've heard yet. So what's that you say? You were really getting into the album and were disappointed when it ended after a relatively short 36 minutes? Well if you don't mind cassettes (and there's no reason you should) then you might want to check out Further Transmissions From The Biosphere. Released on the excellent Italian cassette only label, Best Kept Secret, side A of this set includes all 8 songs from the original CD release, and side B consists of 12 unreleased tunes. Some of the unreleased tracks are a bit more on the lo-fi side, which is very much in keeping with Best Kept Secret releases. But it does show a more stripped down side of Tyko that may lack the fuller, enveloping feel of the original Biosphere album, but still demonstrates what solid songwriters Tyko are. There's also plenty of spaced out fun, and while I lost track of which song was which, there was one particularly alien UFO instrumental that jumped out at me, which is followed by a cool downbeat sci-fi rhythmic track. Overall there's lots of nice tunes here, some of which have real possibilities if fleshed out a bit more and with better sound. But having immersed myself in 3 Tyko releases for this review I enjoyed hearing this rawer edged side of the band. 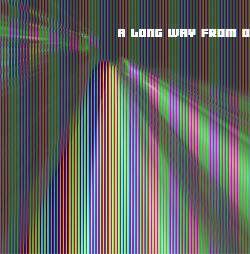 A Long Way From One To Zero is Tyko's newest CD, and on this one the band is a quartet, having added Alex Daniels on drums. (He's also credited on Further Transmissions From The Biosphere so I guess he came on board during or shortly after the original Biosphere sessions.) The songs on the new album are very much in the style of Transmissions From The Biosphere, as both dream-pop song structures and in-yer-face space elements pervade throughout the CD's 9 tracks. "Circles Not Squares" is a killer opening track that builds up to its high powered majestic prog-space theme, and even has a sort of cosmic anthemic quality. The guitars really are gorgeous on this album, and song like "Electrical Saints" demonstrate why Matthew Kesner isn't credited with spaceguitar for nothing. "Solid Air" has that 80's sound that we often hear from Tyko. BUT... this is also one of the most DEEP-in-space tunes of the set. Did I mention how beautiful this bands guitar sound is? Ditto for "Phoenix Ray". On the surface we have an excellent and highly accessible song. But then the band take you by surprise and soar straight into the cosmos. "And The Lights Go Out" is a guitar-fest instrumental assault with head throbbing walls of psychedelic guitar aggression. Harsh... but brain massaging stuff indeed. As an extra treat, the much covered "All Tomorrow's Parties" gets the mind expanding Tyko treatment. In summary, pop music is by no means all fluff and bore. Tyko prove that pop music can be accessible yet adventurous... thoughtfully seductive... and deep in space. For more information you can visit the Tyko web site at: http://www.tykomusic.com. Visit the Blisscent Records web site at: http://www.blisscentrecords.com. Contact via snail mail c/o Tyko; 1624 Alberta Dr; Little Rock, AR 72227.